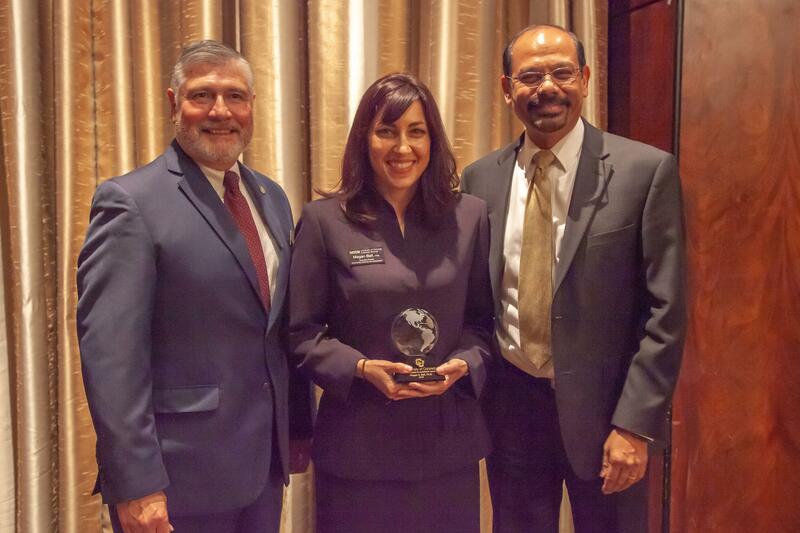 Megan Bell (center), with Carlos Garcia (left) and Chancellor Venkat Reddy at the annual CU Excellence in Leadership Luncheon. With more than eight years of leadership experience at UCCS and 13 years within the CU system, Megan Bell, executive director of community learning and assessment, received the system’s Excellence in Leadership Program Award during the annual ELP luncheon Nov. 30. She was presented the award by Chancellor Venkat Reddy and Carlos Garcia, associate vice chancellor for student success and auxiliaries. Bell manages a $16 million budget, 28 full-time staff and 145 student employees, and oversees the Office of Residence Life and Housing, and the Family Development Center. She led the development of the Academic Commons for evening academic support, learning communities within the residence halls, and the residential learning curriculum with four key components: belonging, citizenship, individualism and academics. Bell is also an assistant professor in the Leadership, Research and Foundations department for the College of Education, where she teaches leadership courses in the doctoral program. She also helped develop an undergraduate minor for student affairs in higher education program. Bell joined the staff at UCCS as associate director of the University Center in 2010, was promoted to director in 2011 and moved into her current role in 2015. She worked eight months as director of assessment and policy in 2017. Bell previously worked at CU Boulder in the University Memorial Center for five years, where she was originally hired by Garcia when he was director of the UMC. Presented to alumni of the system-wide program, Bell completed the program in spring 2018. She was nominated and earned the award in her first year of eligibility. Bell is the third UCCS recipient of the award along with Provost Tom Christensen in 2015 and Barbara Gaddis, senior executive director for student success and student retention, in 2009. Chancellor Emerita Pam Shockley-Zalabak provided the keynote address to more than 175 ELP alumni and participants on building organizational trust. TIAA sponsored the luncheon. ELP provides opportunities for CU faculty and staff to become more effective leaders who can successfully address the challenges of a dynamic university. Since 2000, more than 600 fellows from all campuses and system administration have completed the program.